When my older daughter’s first teeth came in, I was a bit perplexed by how to clean them properly. Using my bare finger? Yuck! That strange-looking rubber thimble with bristles that came in her grooming kit? No, thanks…MAM has come out with an adorable first teeth cleaner that will make the experience pleasant for the both of you. 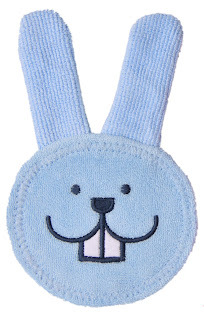 The Oral Care Rabbit is a bunny-shaped soft cloth that gets the job done–and distracts your baby enough to get it done quickly and effectively. Just slip your index finger inside one of the bunny’s ears and brush away. You can either wet it as you would a washcloth, or keep it dry. And if your little bunny happens to be teething, you can try massaging her sore gums for some much-needed relief. Carrots are optional.